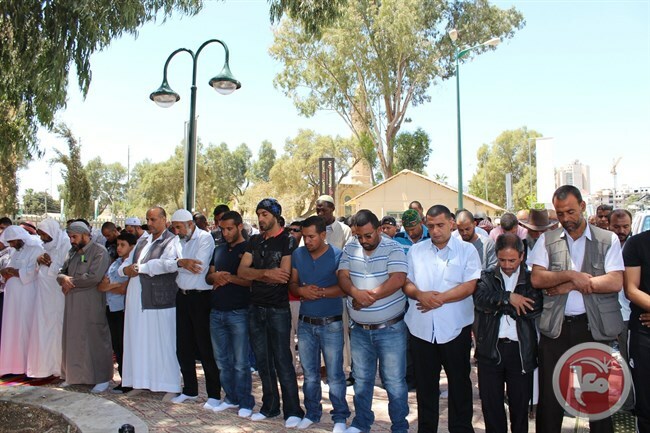 BEERSHEBA (Ma’an) — Some 250 Palestinians performed Friday prayers outside a mosque in Beersheba in southern Israel that Israeli authorities have kept closed since 1948. The prayers came amid heavy Israeli police presence, with police sealing the roads leading toward the mosque. The initiative was called for by Sheikh Hassan Abu Ubeid from al-Ramla along with a group of youths from al-Ramla, Lod and the wider Negev via social networking sites. The Ottoman-era mosque was first closed to Palestinian worshipers in 1948, when it was used as an Israeli prison during the war that led to the creation of the Israeli state and that saw more than 700,000 Palestinians violently expelled from the state’s new boundaries. From the 1950s on, the mosque was designated a museum, which Palestinians had to pay to enter, leaving the area’s 10,000-strong Muslim Palestinian community with nowhere to pray. The community is composed primarily of local Bedouins whose ancestors survived the Israeli expulsions as well as Palestinian citizens of Israel who have moved to the city from other parts of the country. Representatives of the community have long petitioned Israeli authorities to allow them to open the mosque for daily prayers, or at least once a week for Friday prayers. However, the demands have been repeatedly rejected, and in 2011 the Israeli Supreme Court rejected a request for it to open as well, allowing the building to be transformed into a museum focusing on Islam. One of the worshipers present on Friday said he was disappointed that thousands of worshipers had not come to take part in the prayers. Aqel Abu Freih, from the Negev village of al-Araqib, said: “I remember when I finished the 10th grade I used to come to the mosque to pray and pay for a ticket to enter the mosque as a visitor and pray.